Again, mightnt amount to a hill of beans, so caveat emptor. Its a raffle, but a WAS LB spot up for grabs. Spaight was an SEC first teamer (120+ tkls iirc?) and played for Arkansas after jumping from comm college. Drafted in 5th 2yrs ago, missed last year with a concussion. RotoWire wrote: Pullard will stick around in a starting role at inside linebacker, despite Denzel Perryman's (ankle) return to action in Week 10 against the Jaguars, Dan Woike of the Los Angeles Times reports. Analysis: Pullard has certainly earned his stay in the lineup, recording at least eight tackles in each of the last four games. 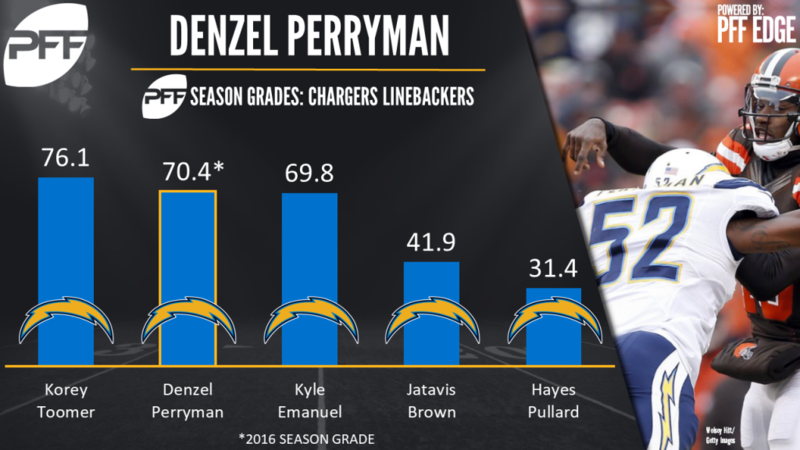 Perryman will take over as the weakside linebacker, bumping down Jatavis Brown's snaps as a result. Despite the shakeup in the linebacking corps, there's a chance that Perryman does move back inside if Pullard's play slips, but at least for the moment, it's Pullard's job to lose. Dont mean much (at this stage), but coming out of the bye on the Injury Report yesterday? Pullard is a newcomer and was Limited (Neck), Perryman was a Full participant (Ankle). In redrafts? (Unless its a 16 teamer, deep bench, start 3+ from hell?) Dont bother. Like, at all. In Dynasties? Its still a pretty tough sell. But damnit if Avery Moss (rookie DE/ NYG) didnt look like the Giants best player on D last week. I know, i know. Based on last weeks effort, thats a bit like being the richest man in a house full of beggars - but you can only pick up whats on the WW. Thats the bad. The good is hes taking his chances & we're way too deep into the season for season changing WW adds to be as plentiful as sand on a beach. Cliff's: Got PT as a Fr in Nebraska. Rotated w/Randy Gregory as a So. Had to sit out 2014 & transfer because he went a bit weird (Indecent Exposure charge - and he deserved it - as well as a restraining order for the campus) and lit it up for Youngstown (In his final year? 59 total tackles, 42 solo stops, 17.5 TFLs, 11 sacks, 4 FFs, 8 QB hurries) & got drafted in the 5th. If youve got the patience, roster space and the need, its not the worst thing out there this week, just dont expect too much. Stash candidate only once OV gets back. benching pullard for schobert this week. i want to see how things flesh out this week. Sean Lee's hammy makes Hitchens quite relevant again. scootm44 wrote: Sean Lee's hammy makes Hitchens quite relevant again. Yeah, that didnt last long did it. Hopefully a winner will rear its ugly head at some point - but Spaight looks like a good bet. In DT leagues, Godchaux's been enjoying himself of late.